What are the main messages of Laudato Si, Pope Francis's groundbreaking new encyclical on the environment? The greatest contribution of Laudato Si, to my mind, is an overview of the environmental crisis from a religious point of view. Until now, the dialogue about the environment has been framed mainly using political, scientific and economic language. Now, the language of faith enters the discussion -- clearly, decisively and systematically. The disproportionate effect of environmental change on the poor is strongly highlighted in almost every page of the document, and the Pope provides many baneful examples of the effects of climate change, whose "worst impact" is felt by those in developing countries (25). Pope Francis takes aim at the "technocratic" mindset, in which technology is seen as the key to human existence. He also critiques an unthinking reliance on market forces, in which every technological advancement is embraced before considering how it will affect our world. Christian spirituality, by contrast, offers a growth marked by "moderation and the capacity to be happy with little" (222). Against those who argue that a papal encyclical on the environment has no real authority, Pope Francis explicitly states that Laudato Si "is now added to the body of the Church's social teaching" (15). It continues the church's reflection on modern-day problems that began with Leo XIII's encyclical Rerum Novarum, on capital and labor, published in 1891. In Chapter Two, Pope Francis introduces "The Gospel of Creation," in which he leads readers through the call to care for creation that extends as far back as the Book of Genesis, when humankind was called to "till and keep" the earth (67). But we have, sadly, done too much tilling and not enough keeping. 6. Everything is connected -- including the economy. Laudato Si is a "systematic" approach to the problem. First, the Pope links all human beings to creation: "We are part of nature, included in it, and thus in constant interaction with it" (139). But our decisions have an inevitable effect on the environment. A blind pursuit of money that sets aside the interests of the marginalized and the ruination of the planet are connected. Pope Francis does not try to "prove" anything about climate change. Rather, his encyclical accepts the best scientific research available today and builds on it. So Laudato Si draws on both church teaching and contemporary scientific findings from other fields to help modern-day people reflect on a contemporary crisis. Pope Francis strongly critiques those who ignore the problem of climate change, and especially its effects on the poor. Why are so many of the wealthy turning away from the poor? Not only because "some view themselves as more worthy than others," but because frequently because decisions-makers are "far removed from the poor," with no real contact to their brothers and sisters (90, 49). Selfishness also leads to the evaporation of the notion of the common good. Perhaps more than any other encyclical, Laudato Si draws from the experiences of people around the world, referencing the findings of bishops' conferences from Brazil, New Zealand, Southern Africa, Bolivia, Portugal, Germany, Argentina, the Dominican Republic, the Philippines, Australia and the United States. The pope invites into dialogue and debate "all people" about our "common home" (3). This encyclical, addressed to "everyone living on this planet" calls for a new way of looking at things (3). We face an urgent crisis, when the earth has begun to look more and more like, in Francis's vivid image, "an immense pile of filth" (21). Still, the document is hopeful, reminding us that because God is with us, all of us can strive to change course. We can move towards an "ecological conversion" in which we can listen to the "cry of the earth and the cry of the poor" (49). 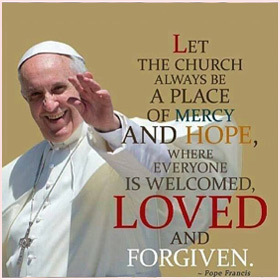 To use religious language, what the Pope is calling for is conversion.